The rocket that launched today was the Soyuz FG, which sent up a Progress capsule filled with food and supplies to the three crew members on board the ISS. Roscosmos has already launched versions of the Soyuz rocket three times since the October incident, but those vehicles were not in the same configuration as the one that failed. But on October 11th, the rocket broke apart just minutes after launching from Baikonur Cosmodrome in Kazakhstan, with NASA astronaut Nick Hague and Russian cosmonaut Alexey Ovchinin on board. "The state commission held a meeting after the launch of the cargo spaceship from the Baikonur space center. With its engines throttled up to full thrust, the Soyuz rocket, carrying a Progress cargo ship loaded with 2.8 tons of supplies and equipment, blasted off from the Baikonur Cosmodrome in Kazakhstan at 1:14 p.m. EST (GMT-5; 12:14 a.m. Saturday local time), climbing directly into the plane of the space station's orbit. A third resupply mission, this one using a SpaceX Falcon 9 rocket and Dragon cargo craft, is scheduled for launch Dec. 4, the day after Kononenko and his crew arrive on board station. The Progress spacecraft was originally scheduled to be launched to the ISS on October 30 but the launch was rescheduled for November 16 following the abortive launch of October 11. Russia’s state space corporation, Roscosmos, successfully launched a cargo capsule to the International Space Station this afternoon — using the same type of rocket that failed more than a month ago with two astronauts on board. NASA astronaut Nick Hague shaking hands with NASA administrator Jim Bridenstine following the aborted launch in October Image: NASA/Bill Ingalls Roscosmos said the sensor had been damaged during the rocket assembly process, and that it was possible that two additional vehicles had the same issue. The Progress cargo ship launched Friday was perched atop the same model booster used for space station crew launches. Soyuz-FG carrier rocket with a manned Soyuz MS-10 spacecraft blasted off from Kazakhstan’s Baikonur Cosmodrome to the International Space Station (ISS) on October 11. Director General of Russia’s space corporation Roscosmos Dmitry Rogozin has thanked all those behind the successful launch of a Soyuz-FG carrier rocket on Friday. A Russian Soyuz FG rocket, identical to one that malfunctioned during launch last month and forced a space station-bound crew to execute a dramatic abort, successfully boosted a cargo ship into orbit Friday. 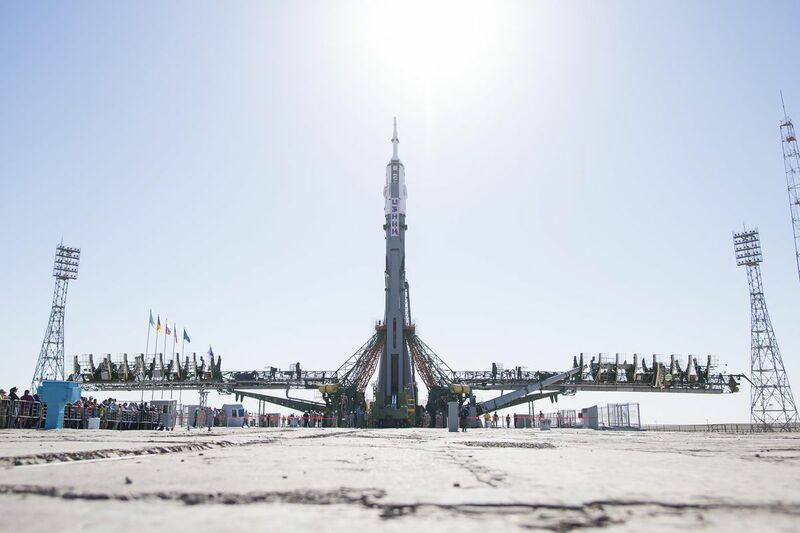 Given the rocket's apparently flawless performance, the Russian space agency, Roscosmos, is expected to proceed with plans to launch the Soyuz MS-11/57S spacecraft on Dec. 3, carrying commander Oleg Kononenko, Canadian flight engineer David Saint-Jacques and NASA astronaut Anne McClain on a four-orbit flight to the space station.